The cold weather since Christmas delayed the seasons, the pond was frozen over several times, but in mid April the weather became warmer, and soon Marsh Marigolds made an appearance and started to flower, in fact this year they were almost the first to flower at all. Once again Newts have been seen in the water. By the summer of 2012, the pond water had cleared, the plants were becoming established. In the spring common newts had been seen, there were lots of water boatmen, diving beetles and other insects that inhabit ponds. On hot days in the summer the pond became the haunt of several types of dragon flies, and damsel flies. As 2012 started out very dry, it was thought that the pond may dry out, but a wet summer soon filled it up, and so it remained over the following winter. Water Plantain, Flowering Rush, Marsh Marigold, Hemp Agrimony, Flag Iris, Gipsywort, Purple Loosestrife, Water Mint, Water Forget-me-not. In mid May the first sign of pond life appeared when a Water Boatman was seen, soon after Pond Skaters a small Diving Beetle and a Lesser Boatman made an appearance. There are also lots of small UFO's, that is Unidentified Flying Objects more commonly known as flies that fly about a centimeter above the surface of the water. 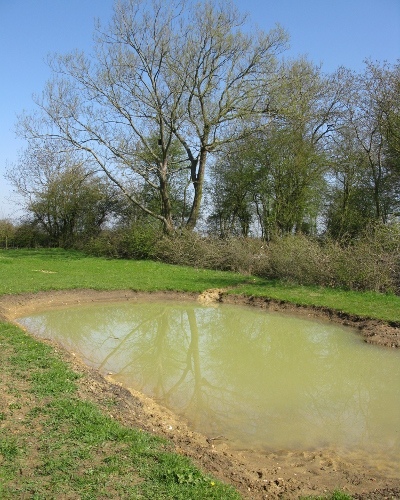 The pond was dug out in autumn 2009, and the spoil was used to make a Badger den in the spinney. It was not lined, but has filled up during the winter of 2009-10. It is 5 feet deep in the middle, and at the left hand end in the photograph so care should be taken not to fall in.